The SW-SATA2X4 4 Port SATA II / III Switch provides a high performance link between one SATA host port and 4 SATA device ports. Bay Mounted, the push button switching and Key Lock design for security make this SATA switch a keeper! 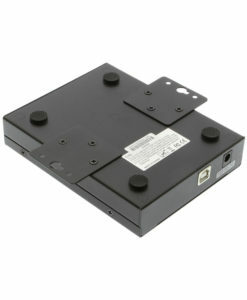 Allows HDD Selection by discontinuing power to other drives. Supports Key-Lock mechanism preventing unauthorized device setting changes. 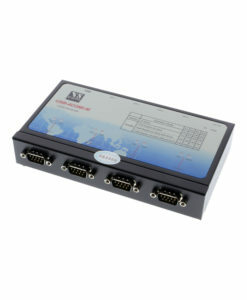 Supports Serial ATA devices with up to 1.5Gb/s, 3.0Gb/s, or 6.0Gb/s Transfer Rate. 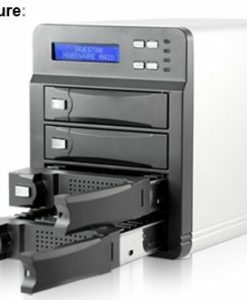 Supports any Serial ATA devices: Hard drives, Removable HDD, and more coming devices such as CD-ROM, CD-R, CD-RW, Tape, IOMEGA, LS-120, DVD-ROM. The SW-SATA2X4 4 Port SATA III Switch is Bay Mount designed to provide a high performance link between a single SATA 2/3 host port and 4 SATA device ports. It connects the host upstream port to one of the 4 downstream SATA devices (one device at the same time). It is done by simply pressing the push button switch. With its Power Switching circuits, the SW-SATA2X4 can switch the devices power according to the settings of the SATA II / III signal switch once bay mounted. The 4 Port SATA Switch only allows the selected device to be powered and cuts off the powers of the other un-selected devices. This reduces the power consumption and makes sure those devices are truly off line to prevent from any accidental erasing of data by virus or application software. The SW-SATA2X4 4 Port SATA switch provides a key lock mechanism to prevent from any unauthorized changing in drive or device settings. It helps home and school users to manage the devices quickly and easily. The SW-SATA2X4 is designed for optimum performance, expand ability and security. It is an ideal upgrade solution to support SATA and SATA2 devices for the rapidly changing data to preserve the user’s investment in the SATA interface. Depends on the Upstream Host Controller. It is transparent from the Operating Systems. The concept is great, the implementation is good but a huge disappointment when the first installation indicated that Ports (drives) 3 & 4 were DOA! Hopefully the replacement will work better. I agree with some assessments, such as the drive selection process, one switch per drive would be better than racing the 10 second boot process to punch the button 5 times to get to drive 4! The key seems redundant! Overall I am pleased despite the failed product. If the replacement fails then logic 1 goes to 0! Please put the LED lights farther apart. Please allow the user to choose the HD before pressing the ON/OFF button on the computer. Four buttons instead of one so we can press a button once instead of up to 4 times would be very good. I love the product. I bet many households avoids buying a second computer because they bought the switch. I bought 3 switches and like 2 years later they all work. I agree with other reviewers…. the manual needs to be redone. You cannot even see the pictures clearly enough to figure out what the intent is. So, here is how to hook up the cables, and the description is valid if you set the device down and look at it from the rear. If you do this then (1) to the far left is the power-out connectors for up to 4 drives. For those 4 the first set of two (against the far left edge) are for drive 2 against the rear edge, and then drive 1 in front of 2, towards the front. The next set of two is for drive 4 and 3, with the drive 4 connector being against the rear edge. Next, to the right, comes (2) a stacked set of two SATA data male connectors with the port for drive 1 on top and that for drive 2 beneath. Then, to the right of those, comes (3) a single male SATA data port for a single SATA cable to interface between the device and your motherboard. Then, to the right of that comes (4) another stacked set of two SATA data male connectors with the port for drive 3 on top, and that for drive 4 beneath. 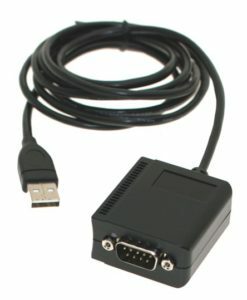 Finally, to the far right comes a single connector for power to come in from the workstation to feed the device and whichever ever single drive you have selected to be active. A much better idea than setting up several operating systems on a mult-boot drive. Important during this time of Windows XP, 7, 8, and now 9 Beta. Your product works as expected. 1) Make the LEDs in 4 corners of the faceplate instead of so close together. My full tower computer is under my desk and I have to sit on the floor to see exactly which LED is on. 2) Let me choose which HD I want to connect BEFORE I press the power on my computer. It would be safer to cold swich the HDs instead of hot switching them. 3) The key and lock are probably expensive. Please make a less expensive version of the product without a lock. 4)If I could select the HD with a knob when the computer is still off that would be very good. The quality of the manual is very poor. It is unclear and hard to see what SATA ports are 1 and 2 or 3 and 4. I’ve wanted something like this for YEARS. Works exactly as I’d hoped. It’s like I’ve got two computers in one case now. Thank you Cooldrives. Thank you so much. This needs to be on Amazon. i tested 4 port sata switcher in my pc.